Every cook seems to have her own recipe for the Russian version of sauerkraut, which has been known to make even life in a civil war bearable. When I started this project, I was prepared for a few errors along the way and here is the first serious one: sour cabbage. It is an addition to any lunch or dinner made throughout Russia by mostly older women who share their recipes as though they were the most exciting story ever. They have a kind of “cabbage club,” and I’ve witnessed a few of them. I had to stop my grandmother from using the exciting opportunity to tell me her version of the gripping tale. I have to follow the recipe in the book, I told her. Much to her delight, I failed miserably. She laughed and told me to throw my cabbage out. Now that the crisis is over I have to analyze where I went wrong. First, I couldn’t find a glass jar in any of the shops nearby. However, the Book says you can use a clay pot, and I had one at home. The recipe said to put pressure on the pot, so I got a jar of pickled ginger and put it on some little wooden slats to weigh it down. Then there was the birch stake I was supposed to impale the cabbage with – not one of the selection I had worked. Granny said I had cut the cabbage too thickly, didn’t squeeze it enough, used too small a pot and didn’t have nearly enough pressure on top. She once again offered her own recipe. I promised to think about it. My great-grandmother would tell that story at almost every dinner. I always liked the idea of a fun atmosphere of so many young people playing games together, eating a simple dinner, then playing again until the curfew was lifted in the morning and they could go home. Pickles really can make any meal better, even during a civil war. I will get better at this. I will make the right cabbage. I’ve been spoiled with too much choice, but as the choice is disappearing, it’s time I learned some of the good old staples. I might ask Granny for her recipe after all. Sour cabbage can made in wooden tubs. A small amount (5-10kg) can be pickled in glass jars or clay pots. Choose good heads of cabbage without green leaves, cut the heads into strips and mix with salt (250g of salt for 10kg of cabbage). Cover the bottom of the cleaned tub with a tiny layer of rye flour, cover it with cabbage leaves and then put as many cabbage strips inside as possible. Cover the top with cabbage leaves. To add flavor and aroma, you can add carrots cut into circles, apples (the antonovka kind), cowberries and cranberries. Put a wooden circle on top of the tub and weigh it down with a clean stone. 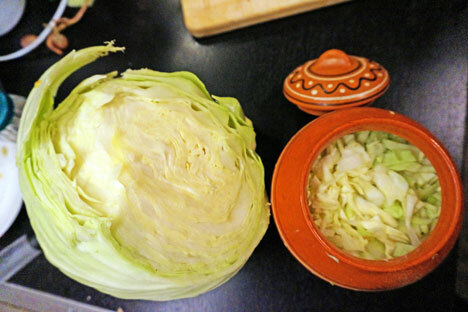 After several days, the cabbage will start to sour and a layer of foam will appear on the top. The amount of foam will first increase and then disappear. When the foam is gone, the cabbage is ready. During the souring process, poke the cabbage frequently with a clean birch stake to release gas. If When it happens that means that the cabbage is sour and ready. While pickling pierce the cabbage with a clean birch stake, so that gas could go out. If mold or crystals appear on the top during the process, remove it carefully and continue souring.